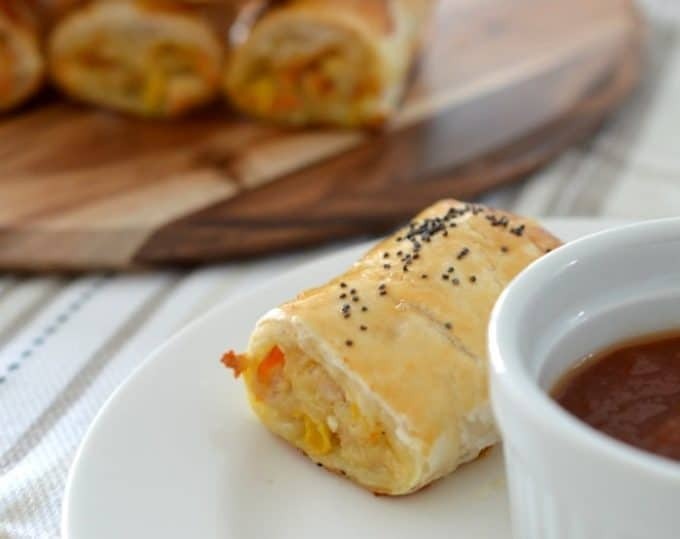 These Chicken and Cheese Sausage Rolls are a great recipe to enjoy when sitting back watching the footy, as an easy midweek meal or for your next party! This recipe is inspired by my Chicken and Vegetable Sausage Rolls which are always a big hit whenever I make them. My boys love to eat anything encased in pastry, so I put together this recipe to try and come up with something a little different for them, which still smuggles a few veggies into their little tummies. 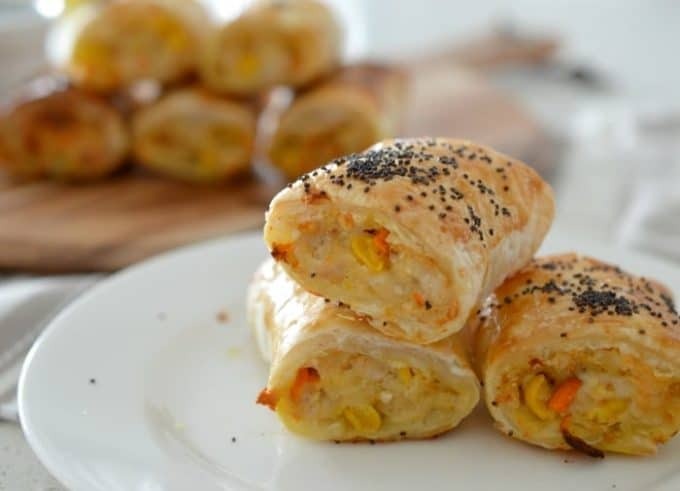 The addition of cheese to this recipe gives these Chicken Sausage Rolls a really yummy flavour and I also added corn, grated carrot and grated zucchini to the mix. If your kids are fussy and will spot the veggies (mine are little pigs and eat these too fast!) then you can easily leave the veggies out or substitute them for something your whole family will enjoy. 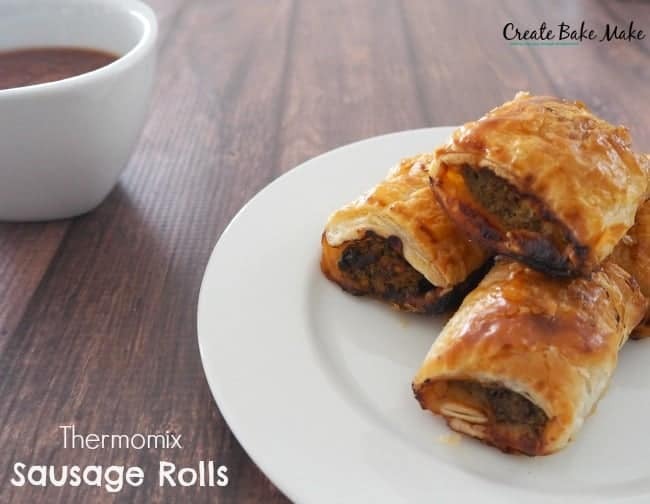 When putting together these sausage rolls, don’t be alarmed if the mixture is a little dry, the cheese will melt while they are cooking and they will be lovely and moist. 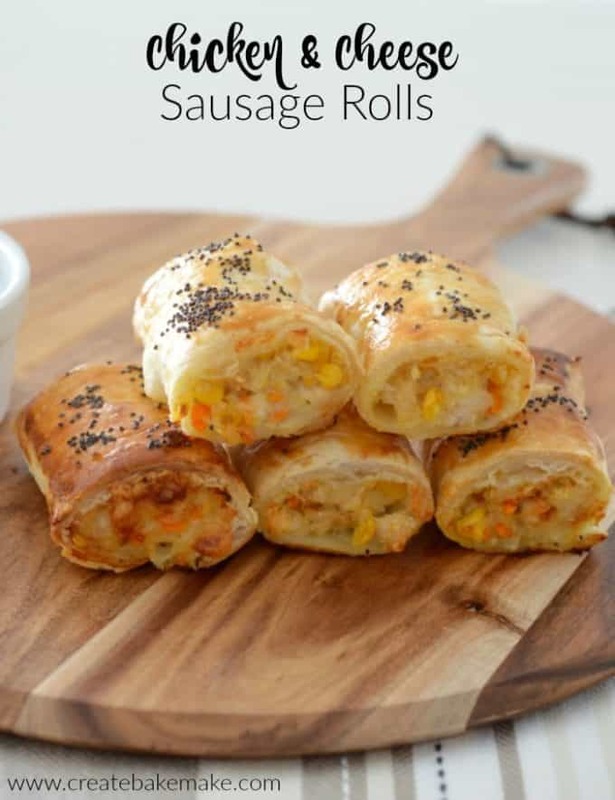 These Chicken and Cheese Sausage Rolls are also freezer friendly and I’ve made a couple of batches already to store in the freezer for easy lunches/snacks during this crazy time while we are all still adjusting to a newborn in the house – we are getting there though! Preheat your oven to 210 degrees and line two trays with baking paper. Remove the puff pastry from the freezer and set aside to thaw slightly. Lightly whisk egg in a small bowl or mug - set aside. In a large bowl using a metal spoon, combine the chicken mince, zucchini, carrot, corn kernels, mixed herbs, onion flakes, salt and pepper, 1 egg and the tasty and parmesan cheese until well combined. Remove plastic from pastry sheet and cut in half with a sharp knife and brush long edges of pastry with egg. Carefully roll the pastry over the top of mince mixture to fully enclose it. 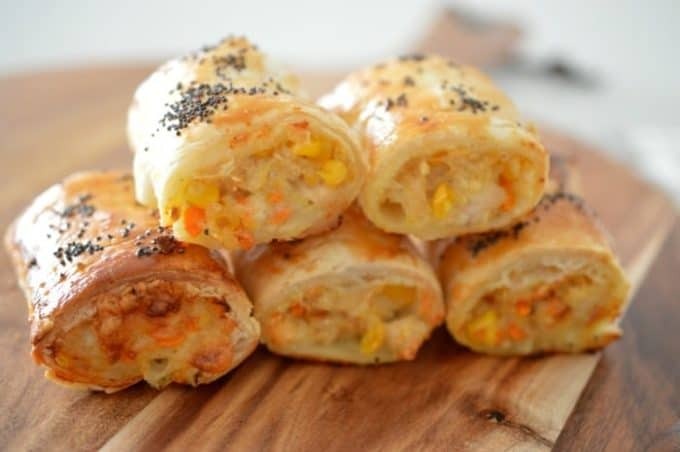 Cut the chicken and cheese sausage rolls into four pieces. Brush the tops with a little of the beaten egg and sprinkle with poppy seeds (optional) and place on a tray lined with baking paper. Place in oven and bake for 25 - 30 minutes or until pastry is crisp, golden and the chicken and cheese sausage rolls are cooked through. Place the tasty cheese and parmesan cheese (which has been cut into 2cm pieces) into your Thermomix bowl and blitz for 10 seconds on speed 9 or until finely grated. Set aside in a separate bowl until needed. Add the carrot and zucchini which has been cut into 3cm pieces TM into your Thermomix Bowl and mix for 5 seconds on speed 6. If you want a finer consistency, blitz for a further 2 – 3 seconds on speed 6. Add the chicken mince, grated cheeses, 1 egg, corn kernels, mixed herbs, onion flakes and salt and pepper to your Thermomix bowl and mix on Reverse Speed 5 for 15 seconds or until completely combined. Whisk the second egg in a cup and set aside. Cut one sheet of the defrosted puff pastry in half and lightly brush the egg mixture down one long side of each pastry half. Place in oven and bake for 25 – 30 minutes or until pastry is crisp, golden and the chicken and cheese sausage rolls are cooked through. 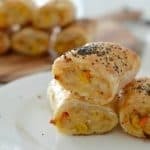 If your family loves sausage rolls too, make sure you check out my Chicken and Veggie Sausage Rolls and Classic Sausage Roll Recipe. I’ve never made sausage rolls. But I reckon I could make these. Chicken and cheese – what a great combination! Can I swap the corn for creamed corn, fussy daughter hates “bits” ? Hi Andy, That should be ok. It may make the mixture a little ‘wetter’ if it is, I’d suggest adding 1/4 – 1/3 cup of breadcrumbs. Hi! Just wondering if I wanted to freeze these, do I cook them and then freeze them or make it all up and freeze them with the pastry raw? I didn’t have zucchini but I placed feta crumbed and beetroot relish to the mix and grated onion as didn’t have onion flakes lol.. didn’t have enough puff pastry so used 1/2 in filo sheets.. see how we go lol..
Ooh that sounds great Keryl, how did it turn out? Is there an alternative to egg or can it be omitted due to allergies? Delicious, l didn’t have corn or onion flakes si went with a half a brown onion. Will make again with a few more spices or l could put some relish on top. Thanks they are very easy to make, but then I’m apparently the queen of sausage rolls.